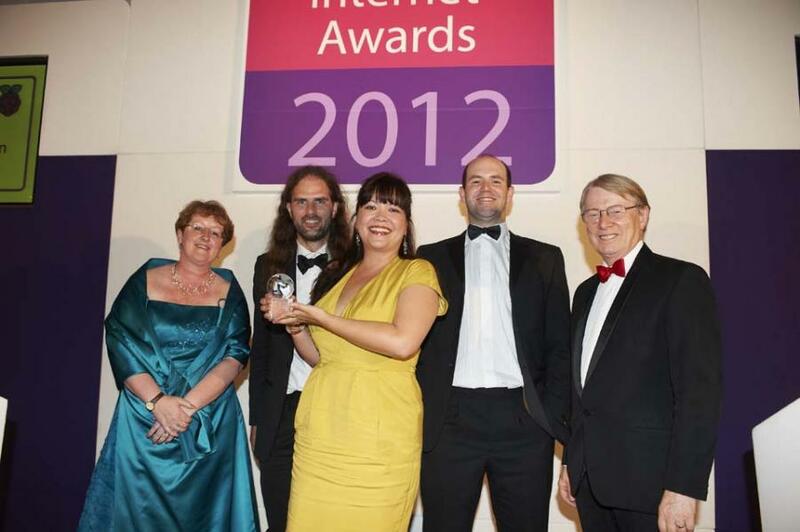 Nominet Outstanding Contribution to the UK Internet Award: we won! Regular readers might remember that a couple of months ago we were shortlisted for a new Outstanding Contribution to the UK Internet Award by Nominet, the body that controls the .uk domain space. Eben, Pete from Mythic Beasts (who keeps this website up and running smoothly despite the fact that more than 100,000 of you visit every day, and thwarts DDOS attacks as if swatting flies) and I went along to the awards ceremony last night. And we ended up winning. The hairy chap is Pete. You may not recognise Eben because he's not wearing a sci-fi t-shirt, but we're pretty sure it's him. Thanks to Nominet for the pictures. We really weren’t expecting to win. There were some pretty remarkable people nominated for the same award (Sir Tim Berners-Lee! ), so we’d settled down to enjoy the awards dinner and were…moderately shocked to find ourselves leaving with a trophy (the downstairs toilet needs more shelves), a certificate and a bottle of champagne. The worst eight words in the English language: “Liz, would you do a piece to camera?” Some video of me blithering gently and numbly about the magic of the intertubes will appear later next week. Thanks so much to all of you who voted. Raspberry Pi simply wouldn’t be here without the community; quite apart from the fact that you buy Raspberry Pis, we rely on you guys to show us project ideas we wouldn’t have come up with on our own in a million years; to help us out with software; and to keep us cheerful and enthusiastic. You do a great job – thank you! Congratulations – you must thoroughly deserve it. You all look fantastic too. Congratulations! Well deserved for coming up with a brilliant idea and then all the team’s hard work in seeing it through. Not really a huge surprise to me after the stunning work you’ve all done to bring this thing to us. You can’t pick up a computer mag at the moment without seeing “Raspberry Pi” on the cover. Congratulations. Well deserved for having a vision and then following through on that exact vision. Keep true to it. Don’t let scope creap change the focus toward higher priced hardware that tries to be all things to all people. I’m looking froward to being able to add to my current slice of Raspberry Pi. Hopefully your Foundation is seeing the benefit already. Congratulations. You guys developed the idea and actually managed to follow it through. Everyone has good ideas but few people see them through to the end. Enjoy that champagne! Congratulations to all of you who work so hard behind the scenes. Congratulations – particularly since at 6am on Feb 29th, you guys single-handedly BROKE the UK Internet, as RS and Farnell’s servers were snowed under like a raspberry in an avalanche! Well-earned and well-deserved Congratulations all around for the Foundation! Your years of hard work are now paying off and it’s good to see that officially recognized. Congratulations Liz, and Eben, you deserve it! Who are the other two peeps in the first picture? 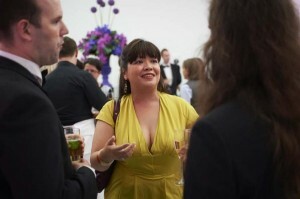 People from Nominet? I truly love your work: congratulations. Is that food-blogging getting the better of you ? Well done. All of the work you’ve done over thew past few years is finally getting the recognition that it deserves. Well done, and many congratulations to all concerned. Congratulations from me too – may this award be the first of many – you have earned them. Liz, it must be a bit like snogging a brillo pad. Minus the soap bubbles, yes. Sorry to be the cynical voice, but WHAT contribution has Rpi made to the INTERNET? It broke it on 29th February. Well, some of it. I think its a good example of internet viral marketing for one thing, it also designed to be internet connected and should therefore enable more people to get on the internet. Its development was largely over the internet, and the huge community of people watching and taking part are all internet based. Just a few reasons of the top of my head. As RorschachUK mentioned having such a cool thing it broke the UK internet was a neat contribution! And like the Nobel Peace prize given to Obama the award may too be prospective – as a mark of approval for the creating a device and a community that eagerly plays with and shares the results of experiments with computing. This will almost certainly have a profound effect on the UK internet in future years: of course if we could tell you exactly what the impact would be we’d probably not be thinking widely enough – we ought to be surprised! Its nice Nominet are encouraging a movement to stimulate engineering skills and creativity rather than efficient business administration etc. Not to mention that the pi also simply gives the many prospective web users in the UK and worldwide a machine they can afford – thus increasing the market for content providers. That said its an interesting point which other awards Raspberry Pi could be eligible for – have the nominations for the ‘Great British Bake off’ closed? Is Eben trying to become the next Transporter? I only voted for Raspberry Pi to see Eben not wearing that T shirt. You know the one I mean. Seriously, well done everyone. We all share in your success. I’ve spent a happy afternoon today with the RasPi running XBMC, streaming in the Red Bull skateboarding videos. It’s worked flawlessly and good quality too.